Ylimmän ylimmän kerroksen huoneisto Calahondan parhaalla paikalla, erittäin mukava andalusialainen kaupunkirakentaminen. Huoneistossa on erittäin mukava parveke aurinkoa ja grilliä varten, upea merinäköala. 2 makuuhuonetta, 2 kylpyhuonetta, avokeittiö ja baari. Ilmainen wi-fi. Hissi, yksityinen maanalainen pysäköinti, tenniskenttä ja iso uima-allas, erillinen lastenallas, trooppisessa puutarhassa kuuluvat niin asuntoon. Ravintolat ja ostoskeskus ovat vain 2 minuutin kävelymatkan päässä. Kiva Beach Calahondan kanssa aurinkotuoleja ja ranta ravintoloita on vain 5 minuutin kävelymatkan päässä asunnosta. Seuraava bussipysäkki on 3 minuutin päässä. 2 makuuhuonetta, 2 kylpyhuonetta, kauniit näkymät kaikista huoneista, Wi-Fi ilmaiseksi. Hissi, yksityinen maanalainen pysäköintitila. Houkutteleva rakennus maurilaisessa tyylissä, hyvin hoidettu puutarha trooppisella kasvillisuudella, suuri uima-allas (aurinkotuoleja altaalla ilmaiseksi), erillinen lastenallas ja oma tenniskenttä talon vieressä. The apartment had a fantastic location. 150 m to Supersol and 200 m to a large number of good quality restaurants. The apartment was in the south so we had sunshine from 9 am to 7 in the evening. Well equipped. We are coming back. The apartment was clean on arrival and had everything from a self catering perspective. The photos give the impression it is more spacious than it is actually is and it felt quite compact especially the kitchen. The photos are quite misleading too as the penthouse terrace is actually on the roof, therefore you have to leave your apartment and go up the stairs to open another door to the roof, if you are having drinks or food it is a bit of a pain so we didn't really benefit from this selling point. Overall, good location, restaurants and supermarkets very close and the boardwalk is only a short walk over the bridge. Get up early if you want a sun bed by the pool, very busy but that might be the time of year we were there so we tended to not bother with the pool. Fin leilighet og fin utsikt fra balkongen. Synd at den store terrassen lå over leiligheten - den ble ikke så mye brukt. Lett tilgang til boligen med heis og en bra garasje for bil. Savnet en god strand i nærheten! Tilgang til mange håndkle, men savnet flere glass og tallerken. Expected more. Reasonable apartment but bit deceiving that roof terrace is accessed by another stairway and is technically a shared area. Balcony furniture rusted, garage key fob stopped working, one of the bathroom sinks didn't drain and hot water in the evening a hit or a miss. Noisy complex as for some this is home so you hear every argument, kids crying etc. Buzzer at gate didn't work so with one set of keys it proved difficult sometimes to access. Also building work going on. Firstly in flat directly below we had a new kitchen being fitted. Sthil saws, hammering, music blaring - not peaceful. Emailed owner who had resort contact investigate. She visited and told us no work should be carried out, by order of the administration, after June 18th (the day we arrived), however, on this occasion work could continue. Then once that finished the down stairs terrace had a wall built. Another 5 days of noise and workmen. Emailed Florentine as not too happy. 3 weeks later still waiting for reply. In fact emailed 3 times - really poor. Take booking, take money but not interested when a problem arises. We are very sorry, if Mrs.Anderson was not happy, even if the housekeeper helpt her between 2 hours whenever she had a question or needed something. All small problems are solved between 1 day in our Apartment, therefore we have a housekeeper and a technician which is reachable per mobile phone 24 hrs for every guest. If a neighbour constructs a new kitchen in his Apartment it could be noisy for a little while, but normally the neighbours don´t change their kitchens several times a year. We never had problems with hot water in the last 2 years of renting, it was always sufficient even for 6 people living in the Apartment. I really don´t know how long this family of 4 persons showered every evening or what else they did with all the water. Heel mooi appartement, heel gerieflijk en alles aanwezig en super goed gelegen. Het appartement heeft 2 mooie slaapkamers met elk een kleine maar nette badkamer. De keuken is klein maar heel gerieflijk ingedeeld met alle mogelijke apparaten aanwezig. 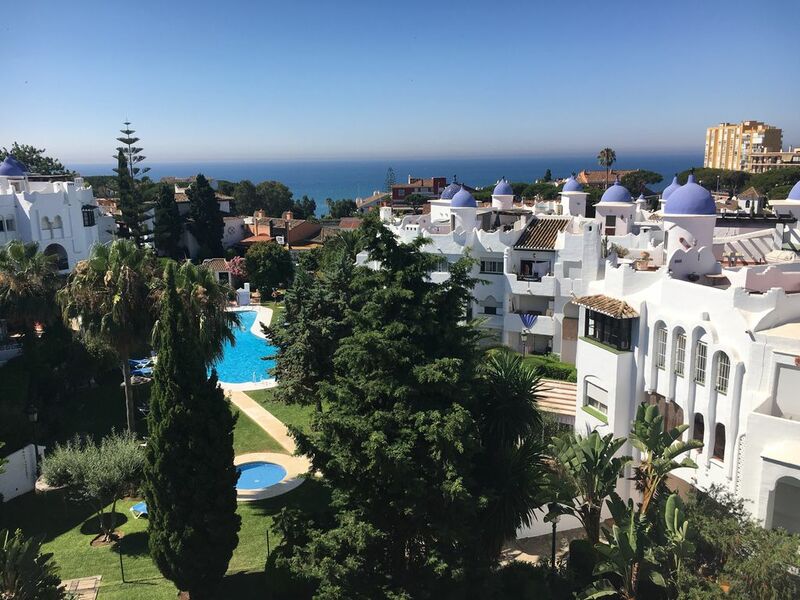 De living is groot genoeg maar bestemd voor maximum 4 personen en geen 6.
over Sitio de Calahonda en zicht op zee. Wat ook heel belangrijk is is de enorme goede ligging voor de restaurants en de supermarkten, alsook de ligging voor naar het strand te gaan. Een echte aanrader ! !